A ferry with more than 250 passengers and crew has capsized in stormy seas off the north-east coast of the Philippines. About 240 people have been rescued, some with injuries, but at least four people have died and seven others are missing. The M/V Mercraft 3 sank in the Polillo Strait between Quezon province's Infanta town and the ferry's destination, Polillo island, officials said. A survivor, Donel Jade Mendiola, told DZMM radio that bad weather briefly delayed the ferry's departure, but the weather improved and the vessel then left from Quezon's Real town. Strong winds and large waves started to lash it about two hours into the trip, he said. "The vessel came to a halt and started taking on water in the front side. 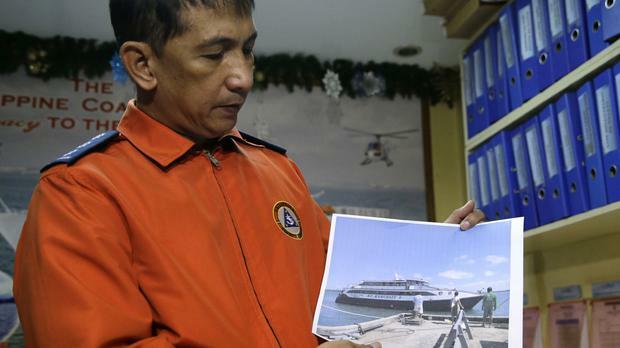 The passengers dashed to one side and the ferry started to sink," Mr Mendiola said. He said the passengers were instructed to don life jackets. Coast guard boats, navy vessels and fishing boats rescued 240 people, including many who drifted in the rough sea, coast guard spokesman Armand Balilo said, adding that the 206-tonne ferry could carry 286 people and apparently was not overcrowded. Among the survivors taken to a Quezon hospital was a 61-year-old Australian identified by authorities as Roland Kempt, who lives in the Philippines, the coast guard said in a statement. The dead consisted of two men and two women, Quezon officials said. Earlier this week, a tropical storm left more than 50 people dead and 31 others missing, mostly due to landslides, and damaged more than 10,000 houses in the central Philippines before weakening and blowing into the South China Sea. The storm drenched Quezon province on the southern tip of northern Luzon island, but there were no storm warnings when Mercraft 3 sailed out, officials said. Rescue efforts will continue after nightfall despite rough waves, Mr Balilo said, adding that a coast guard helicopter tried to fly to the area earlier in the day but was hampered by strong winds. Many of those rescued were taken to a government emergency hall in Dinahican village in Infanta, where Quezon officials brought clothes, food, water and medicine, Juanito Diaz, who heads Quezon's disaster-response agency, said. Frequent storms, badly maintained vessels and weak enforcement of safety regulations have been blamed for past accidents at sea in the Philippines, including on December 20 1987, when the ferry Dona Paz sank after colliding with a fuel tanker, killing more than 4,300 people in the world's worst peacetime maritime disaster.